several examples from between c.1945-70. 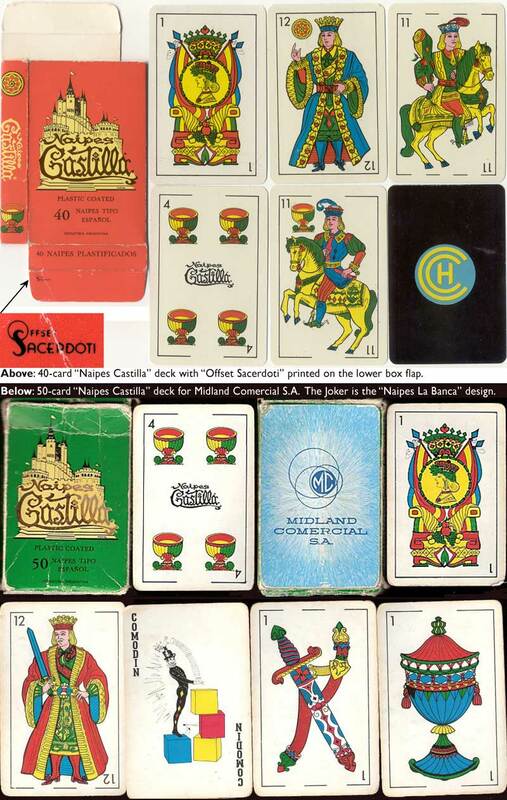 Above: Torcacita playing cards in their original wrapper, sealed with the Internal Revenues tax band. 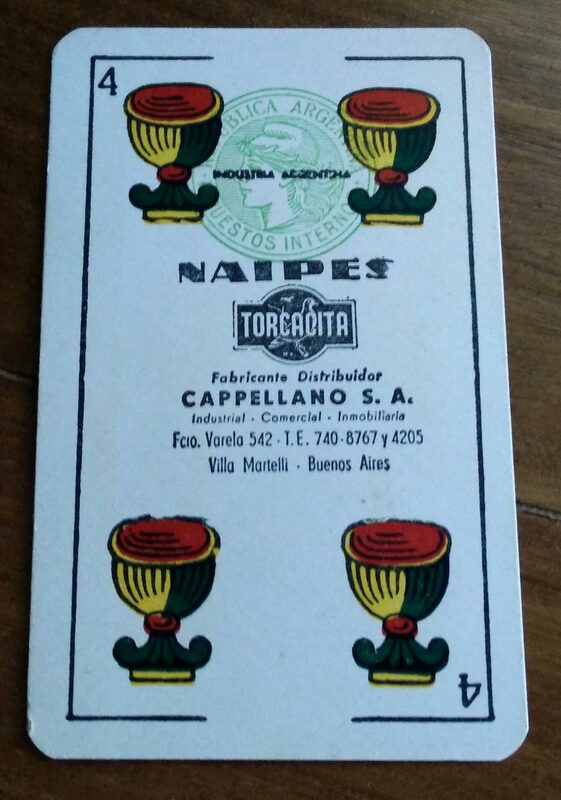 Cappellano's address is given as Sarmiento 1543, and the telephone numbers are T.E. 35‑6160-6168. Cappellano's capital is stated as $200,000. In conjunction with the 50 centavos tax band, the date can be estimated as around 1945. 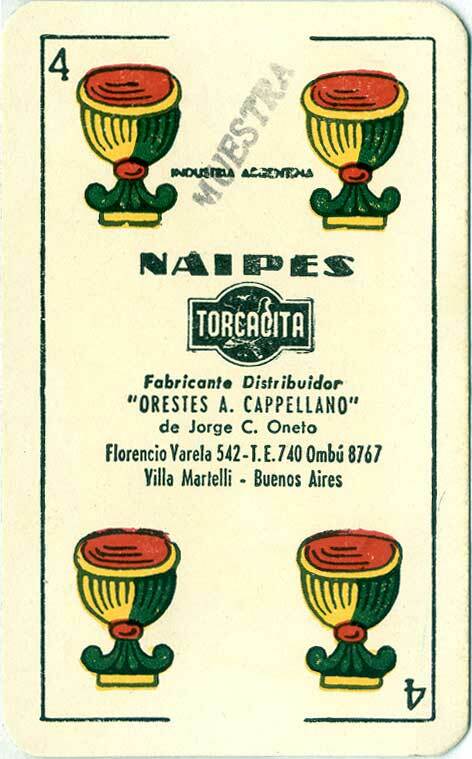 Above & Right: The company name is now Orestes A. Cappellano de Jorge C. Oneto and the address has changed to Florencia Varela 542, Villa Martellí, Buenos Aires. The telephone number is now given as T.E. 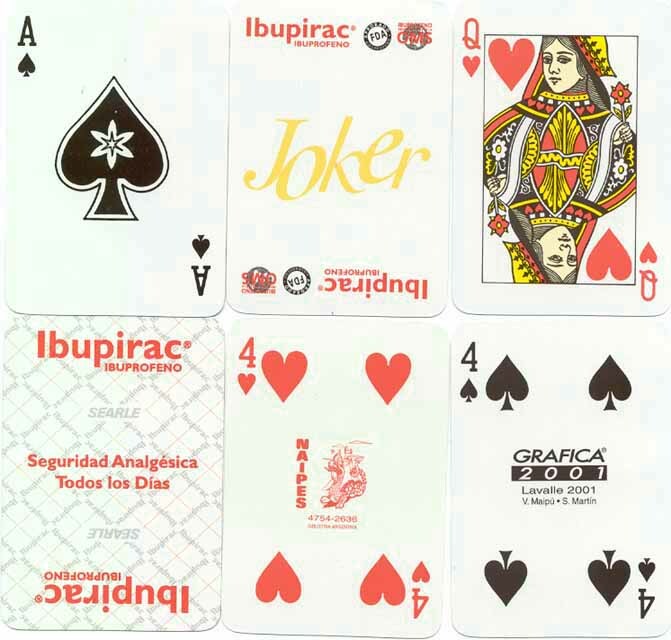 740 Ombú 8767. These changes appear to have taken place around 1950. 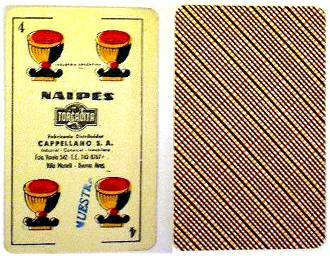 The cards in Naipes Torcacita are exactly the same as those found in Naipes Triunfo except the Four of Cups which has the Torcacita logo and corresponding manufacturer's details. Over the years the company underwent several changes of name and address which is reflected on the wrappers. It is by studying these changes that some sort of chronological sequence has been reconstructed. Above: the brown 50 Centavos tax band has the Decreto 18,235 which was in force between 1944-1964, whilst the Marianne tax stamp on the four of cups was used between 1953-1968. The second telephone number 4205 was discontinued around this time, as later examples only have one number. 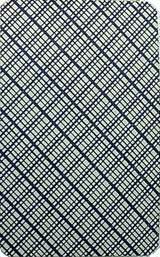 The symmetry of the line of type remains off centre after the second number was removed. The number 8767 is still beneath the word 'VILLA'. Images courtesy Martin Stead. Above: the 5 Pesos brown tax band, corresponding with Ley 16.656, was used between 1965 - 1967. 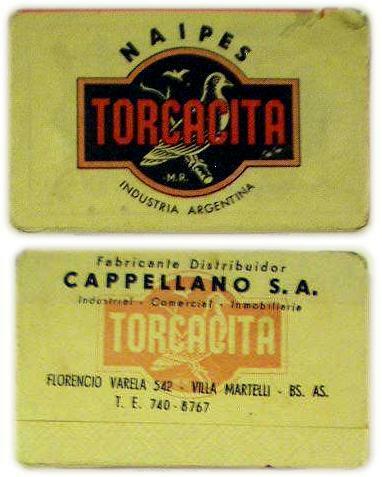 Above: Cappellano's name and address is given as Cappellano S.A., Florencio Varela 542, Villa Martellí, and the telephone number is T.E. 740-8767. From these details, the date can be estimated as around 1965-70.